Hi there Friday! It's the last of the mixed up weeks for a while, right? No more mid-week holidays to get us off our game. What day is it? When do the trash cans go out? I DON'T KNOW! Thank goodness my phone does so I can tell where and when I am! Yesterday I resisted the urge to join any of the quilt alongs going, like the APQ Tone it Down quilt along. There are some amazing blocks and FINISHED QUILTS out there. And just the past few days I've seen some really lovely economy blocks showing up in Rita's quilt along. 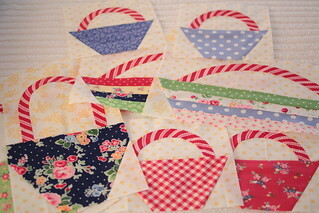 And of course we're knee deep in the Quilty Fun sew along.. I have the bigger blocks done, those pesky small ones are my nemesis right now, my lack of organization is cramping my style. Instead, I pulled out my basket project from OCTOBER and got back to work. I managed to get the majority of my handles appliqued on. I'm using invisible machine applique which I love. Alex and Laura prepped all my handles so it's smooth sailing. I still have work to do but it felt good to get back into the sewing room with something that I just had to sit down and sew on. Sometimes I just don't want to think about it, I just want to sew! Happy Friday! I'm glad to be leaving the chopped up weeks behind for a while too. Time for some fun sewing routines, I'm thinking.